Let the cold wind blow … on someone else! 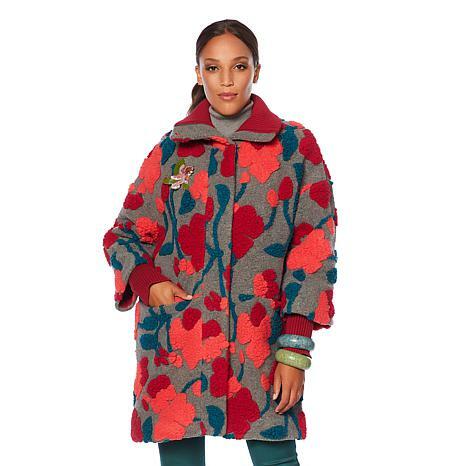 This warm and cozy coat is perfect for the upcoming season. And with an Iris Apfel garment in your closet you always stand out, because, stellar style is always coveted. Iris created an unique fashionable coat that you don't have to worry about seeing yourself coming & going...absolutely unique. I received my Rara Avis coat in the Teal/Brown Ombre pattern today. This is such a wonderful design with the knitted collar and lower sleeve. It has both a full length zipper, and covered snap closure for extra warmth. Iris' style is all over this coat, I can't wait to wear it. Fabulous Coat - Nothing but Compliment! I have this coat in four colors. It is absolutely my favorite coat. I live in Alaska and it is warm and the sleeve inserts are fantastic. Well worth the money you will have it for years. Whenever I wear it, which is almost every day I receive nothing but compliments. I wish she would bring back the red and green for next year. The coral is also a favorite. I love this coat. Have received many compliments. It's warm and colorful. My favorite coat!!! !